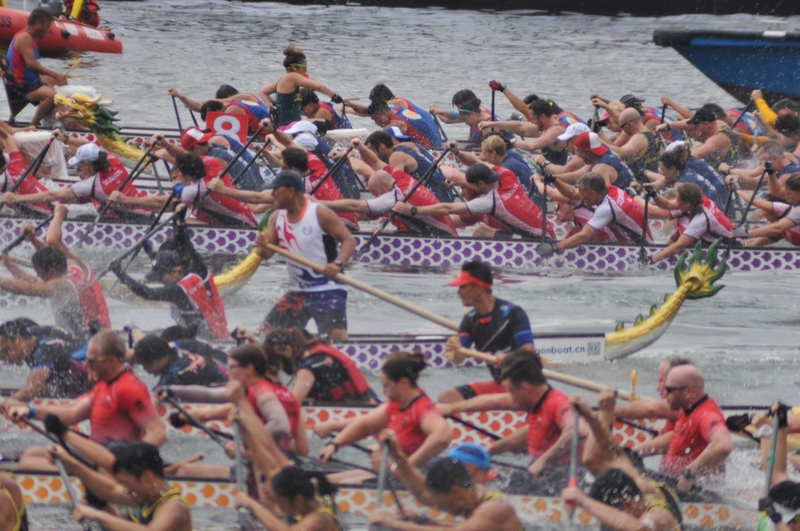 Dragonboaters respond to a unique set of calls and commands (abit like Pavlov’s Dogs – look it up). 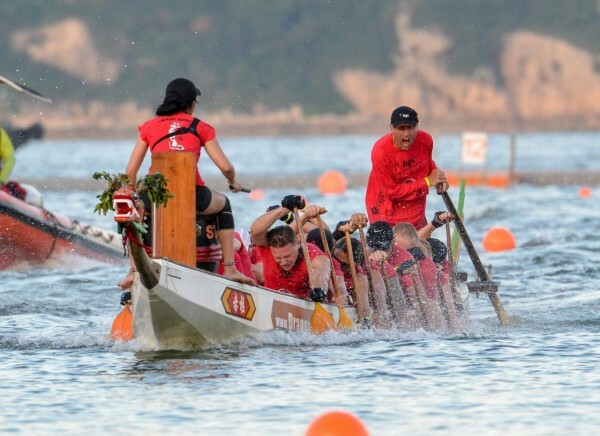 Dragonboat racing therefore requires a good deal of responsiveness from all members primarily for safety but also it’s one of the fundamental differences between social and competitive teams. HOLD THE BOAT – Paddler pushes the blade vertically into the water to put a brake on the boat, bury them fully so the boat can come to a stop quickly. Hold the paddle firmly in the water. BRACE THE BOAT – Paddlers lean out slightly over the side of the boat and pressing their paddle blades flat on the water with slight downward pressure at arm’s length in order to stabilise the boat. The shaft of the paddle pressed against the top of the gunwales. Used especially when transferring seat positions or a wake is coming in. This command will help steady the boat from rocking side to side. DRAW (LEFT/RIGHT) The paddlers will lean slightly out to the side and pull water (deep) towards themselves and under the boat – like having lost an object and they are trying to scoop it back. This is often needed on the start line, when winds may cause the boat to drift sideways and the steersperson is trying to line the boat up directly down the course. Often, the steersperson will only call “Front Two”, or “Front Three Draw Left/Right” or “Back Two/Three.” The numbers means the seat number. ­”Front Three Draw Left” means the first three paddlers on the left draw the boat. If you hear LEFT SIDE DRAW, then all paddlers on left side draw; likewise, on the right. LISTEN UP – Ai ya! Basically shut up and listen to the Coach/Drummer or Helm. Politely – stop chatting, daydreaming or distractions, pay attention and focus into the boat on the task at hand. GO – Start paddling, as in Paddles up, Go! 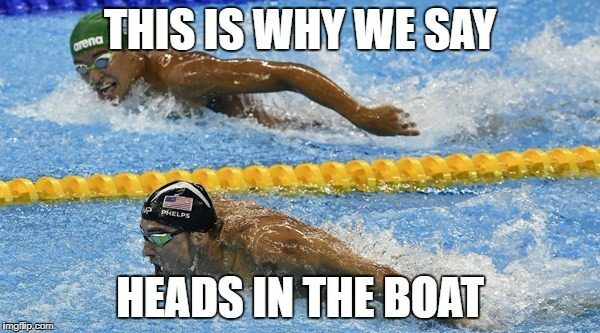 HEADS IN THE BOAT – Look forward and focus in your boat not on what’s going on around you! You can’t influence the boat next to you so put all your attention in your boat! FINISH The point near the end of a race (in a 500m race around 100m to go) when a team’s drummer/steersperson calls for an increase in power and rate. You may look up at this point in pain and think WTF – Where’s the Finish! Come down to Tai Tam Tuk, load the boat, back it down, hold the boat, paddles ready, paddles up, Stormys are you ready? Attention Go!!! This entry was posted in Stormy News and tagged Dragonboat, HongKong, Paddle, Paddling, Watersports by Vicki Easton. Bookmark the permalink.